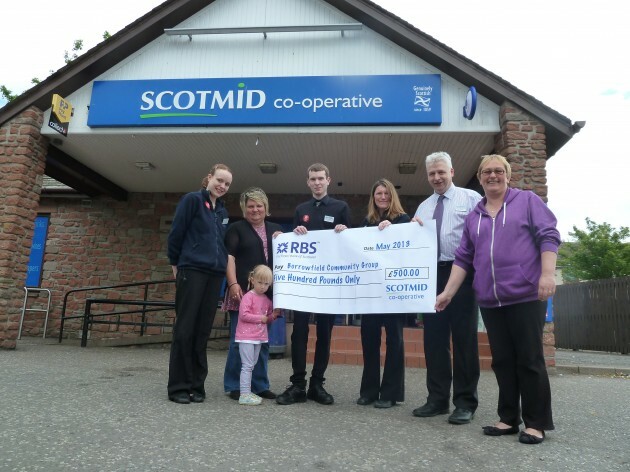 Borrowfield Community Group has become the lucky recipient of a £500 community grant from Scotmid Co-operative. The Group will use the grant towards the refurbishment of Borrowfield Community Hall, particularly a replacement floor, to attract a variety of new users. The hall is used currently by several groups including the popular Friday Night Project for youngsters but outdated, carpeted flooring means that usage is limited and many groups have declined the use of the hall as being unsuitable for their activities. The Group hope that not only will a refurbished hall attract new users but it will also allow for easier maintenance and upkeep. Pictured above L-R is: Jenny Colyer (Scotmid), Fiona Harris (Chairperson, Borrowfield Community Group), Steven Blacklaws (Scotmid), Heather Munro (Scotmid) with Maisie Munro, Allan MacLeish (Scotmid, store manager) and Kay Pekarski (Treasurer, Borrowfield Community Group).